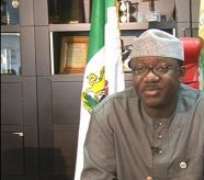 The Governor-elect of Ekiti State, Dr. Kayode Fayemi, yesterday filed his defence to the petition by the candidate of the People’s Democratic Party (PDP) and outgoing Deputy Governor of Ekiti State, Professor Kolapo Olusola Eleka. In the 2,558-page defence with over 3,000 documents as exhibits, Fayemi averred that he won the gubernatorial election of July 14, 2018, convincingly urging the tribunal to dismiss the petition of the PDP candidate for lacking in merit. Addressing the press after filing the petition, Dr. Kayode Olatoke (SAN), who spoke on behalf of his colleagues, said Eleka’s petition was a waste of time as it lacked substance and was sure that the case would be dismissed by the tribunal. He said Eleka’s first ground in his petition is based on Fayose’s phantom indictment, which had been nullified and set aside by a competent court.